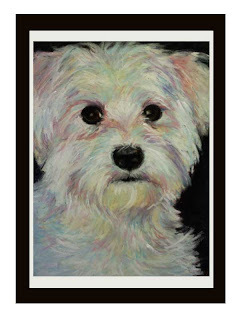 Here is a pastel "portrait" if you will, of a friends pup. Completed on colorfix paper, size: 8 x 10. I always like to work with "whites", and pushing color to go beyond a dull white/grey pallet when trying to interpret a fully white subject. I'm going to be finishing a self portrait in colored pencil quite soon, and hope to keep working as much as I can as the semester ( and my last, yippee!) starts up again this week.